They have been a hit this week, my little ones have loved getting little notes and surprises in their hearts and writing little notes for each other. They were pretty simple to make. Felt is so easy to cut and sew. Here are the steps if you want to give it a go!!! 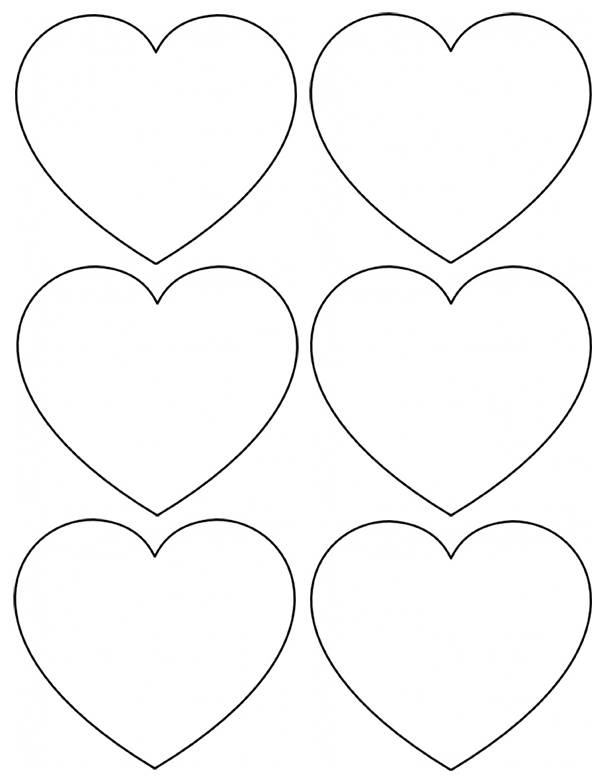 Step 1: Cut out a heart template using paper…I cut out a few different sizes to find the one I liked on my chair. Step 2: Cut out your hearts. 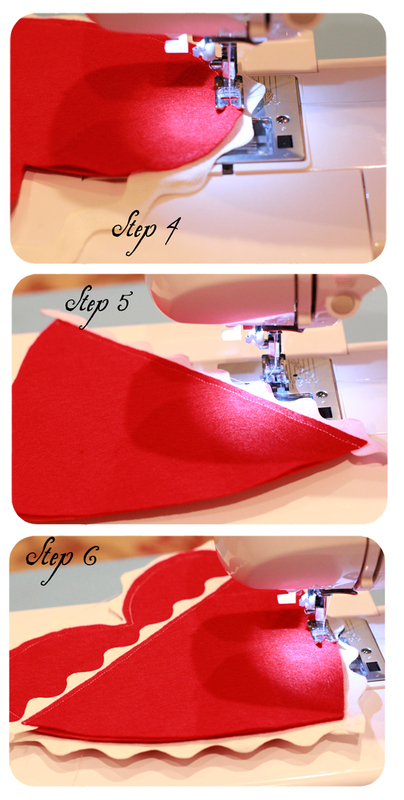 For one heart pocket…you will need to cut both the pocket and heart shape out of the soft felt and stiff felt…so you will have 4 pieces. Step 3: Pin your ric rac between both the soft and stiff felt…Soft felt is on the front…I liked how it looked much better but loved how the stiff felt holds up the heart. Step 4: Sew the hearts together with the ric rac inbetween. Step 5: Take the two pocket parts (the stiff and soft felt) and sew the top of the pocket with the ric-rac in betweeen. Step 6: Now sew the pocket on to the heart. It should match up perfectly. Leaving the opening at the top for the pocket. I then added each of our names using my Silhouette and the white flocked heat transfer paper for fabric. I used a fancier script called CK (creating keepsakes) ELEGANT. I love the personalized touch. 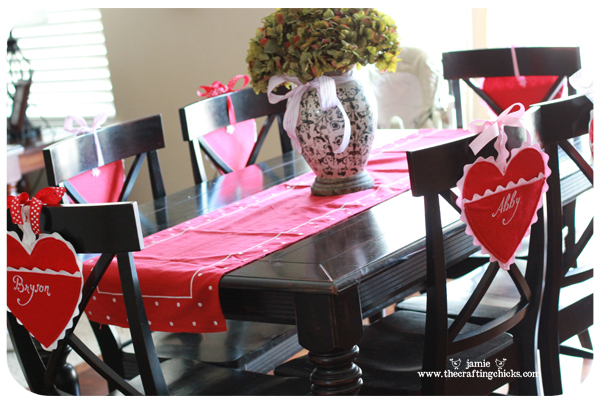 I then made a little loop with the ric-rac so that I could tie them on the chairs with cute red and pink ribbon. 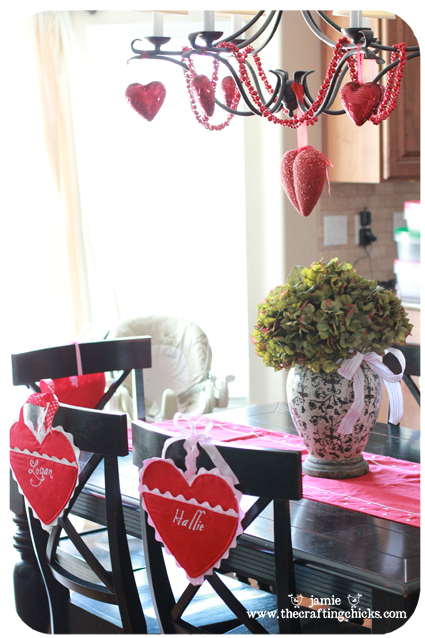 I LOVE how they turned out…It adds a lot of Valentine fun to our house! My kids have been having fun writing letters and sneaking them in our hearts. 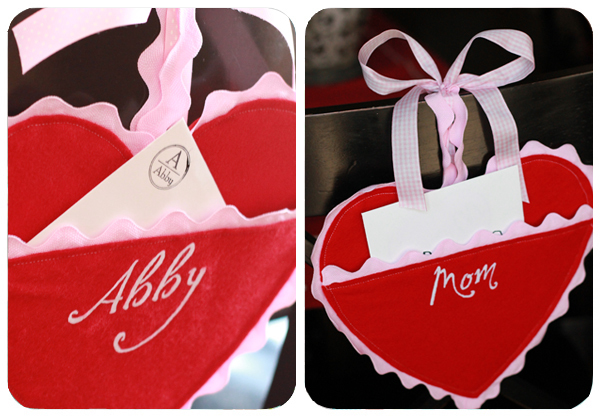 I also have been putting little special notes and treats in the hearts:) It would be fun to do 14 days of Valentine’s next year using these holders. I made these heart shapes (above) in Photoshop, and printed them on red, pink and white. We have a stack of them to write little love messages on. 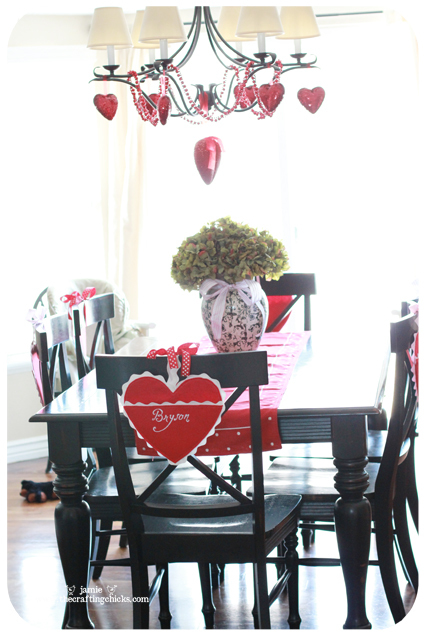 What are some ways you are spreading Valentine’s cheer at your house? We would love to see your projects too! 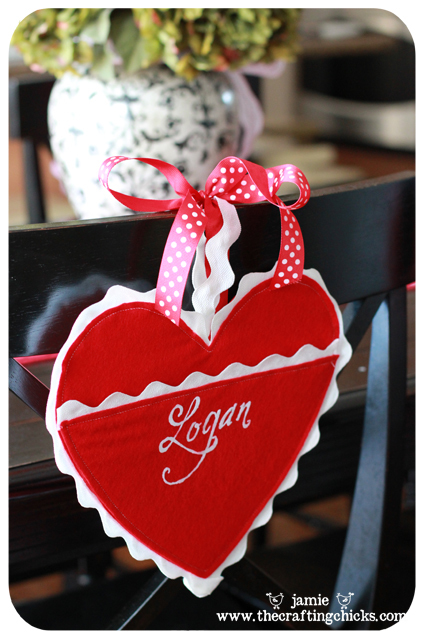 Such a sweet Valentine’s project! And thanks for the easy-to-follow tutorial! So cute Jam! I just got my first sewing machine and I think I might just make these tomorrow! We still have a week to have some fun family valentine fun! Hi I love this project! 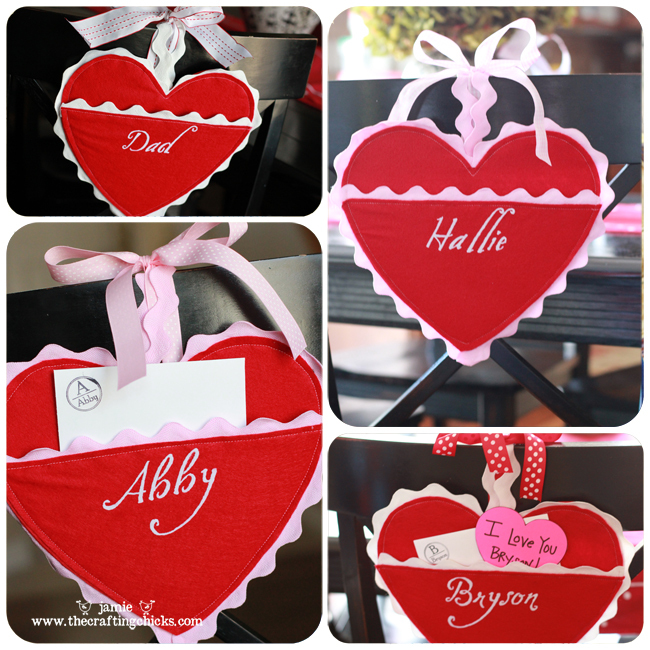 I am having a difficult time finding a large heart template to print for it to be the size you made which is perfect for my little ones. 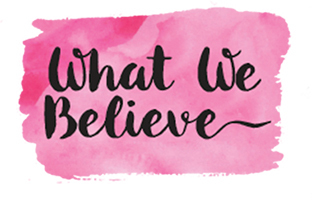 Do you have a link that you found your templates at? Thanks for the info! So cute!! What size is your heart?